Life is always funny when you realize you made a huge, whopping mistake and can be able to admit it. After all, the old saying goes, admitting it is the first step. So what's the second step? Trying to recoup your losses after paying way too much money on a card. 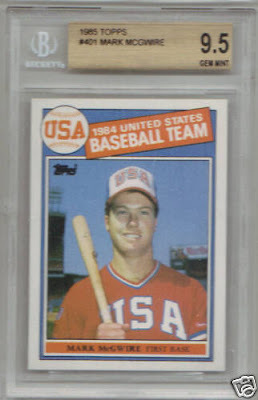 This is a 1985 Topps Mark McGwire RC graded 9.5. The best part about the auction is the description. Here's how part of it reads. "You probably thought to yourself - "what moron actually paid $18,000 for that?" Well, I'm that moron. And yes, I am quite aware that it will sell for so much less in this auction that any question that I truly am a moron will be answered." I don't think McGwire admitting he did steroids changes the value of this card. If there were any McGwire fans out there shocked by his admission than they truly don't know much about baseball and have lived under a rock for the last 10 years. I wish this guy luck and hope he can get some of his money back. There are still Big Mac fans out there. It's up to $113 already. I wouldn't have even paid that if he didn't admit to using steroids. Come to think of it, I wouldn't have paid that much even if he was legit. $18,000 on a card? Are you kidding me? Really? I call shenanigans until I see the actual auction. And I'm not up on this whole grading thing, but would this even be believable if it were graded 10?